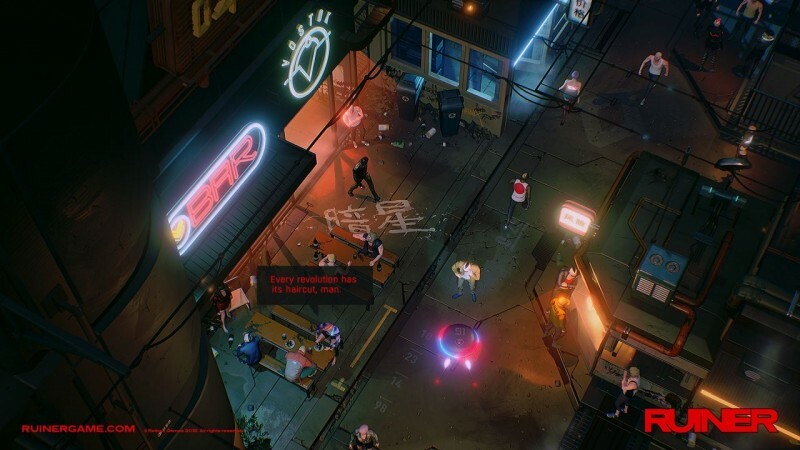 After being relatively quiet for a number of years, the cyberpunk genre has been making a loud return to video games with quality titles like Shadowrun Returns, VA-11 Hall-A, and Observer. The latest addition to the bunch is the unapologetically violent Ruiner. 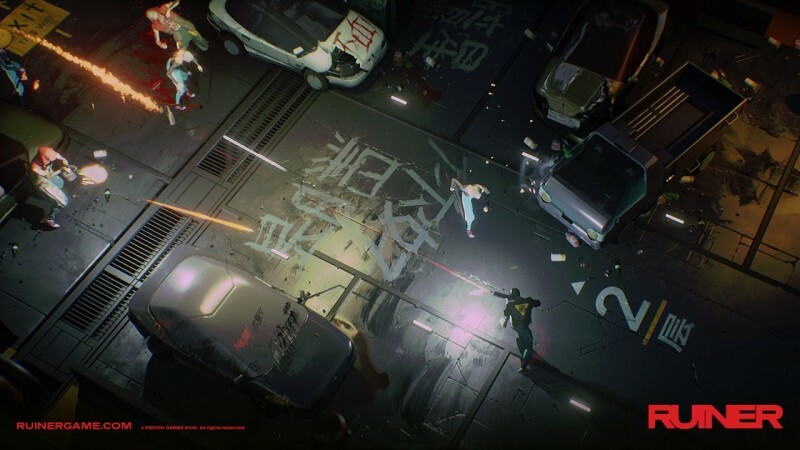 Pulling together bits from Oldboy, Akira, Transistor, and Hotline Miami, Ruiner never reaches the highest points of its genre, but is a fun romp through cyberhell that champions style over substance. 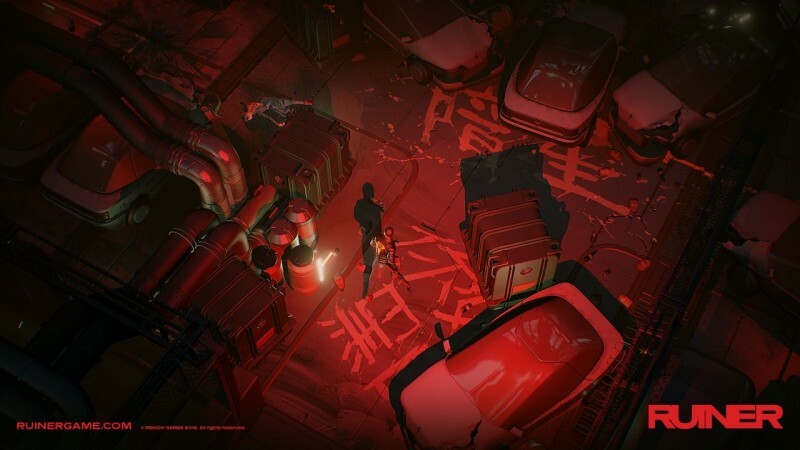 You play an unnamed vigilante who’s willing to tear down an entire city with a steel pipe in one hand and gun in the other to find his missing brother. 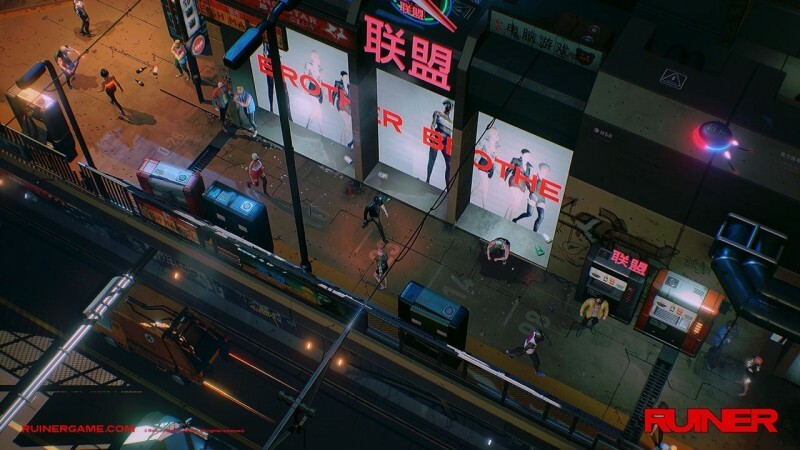 The simple gameplay is clean and well-executed, with you controlling your character’s movements across isometric levels like crumbling parking garages and high-tech factories with the left analog stick and aiming with the right stick. 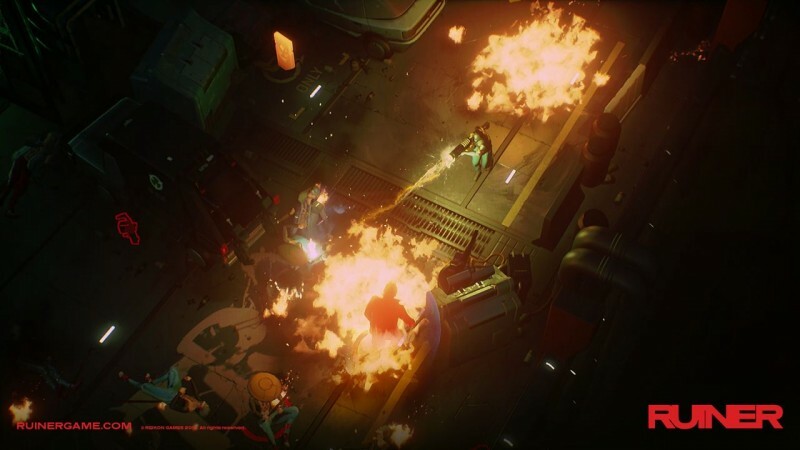 The straightforward, arcadey experience has several linear levels, each one composed of multiple arenas where you duke it out with enemies who become more powerful the further you get. You start with pistol-toting gang members and graduate to robots and mutated monstrosities of flesh and wires that have more health and deadlier weapons. The escalating challenge is well-paced, forcing you to master velocity and precision as you speed around arenas with your dash, dancing between bullets and breaking heads with your weapons. The action is always satisfying, with melee kills launching enemies across the level (their corpses landing with a sickening thud), and the limited-use firearms capable of blowing apart or even disintegrating them on the spot. Besides your melee weapon and firearm, you also have a number of abilities, like a shield that deflects bullets back and a shock grenade that stuns everyone nearby. You also gain buffs that can boost your health and damage output. 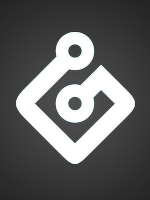 The skill tree and leveling system is simplistic pleasurable to use. Every time I got a new ability, I grinned as I unleashed a new brand of wrath on the idiots who got in my way. 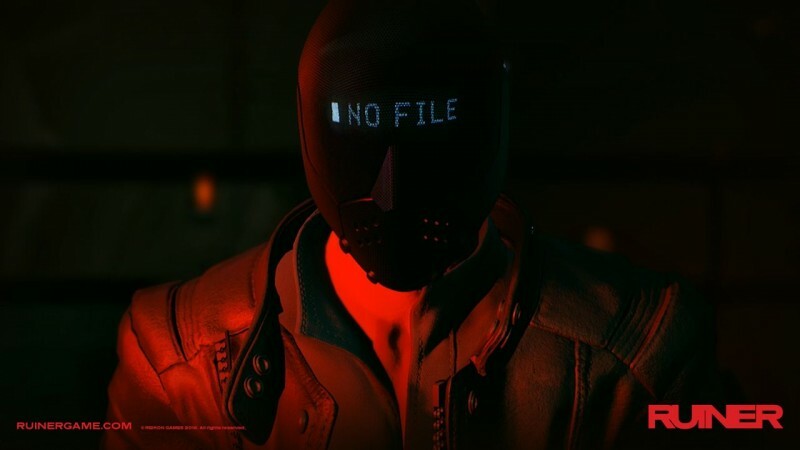 Though Ruiner never diverts from being a game about dodging foes and shooting them, this skill tree lets you customize your character a surprising amount. During my playthrough, I poured all my experience points into my shield ability, damage output, and both health and energy increases, essentially creating a tank character who could recharge his health and take a beating before going down. Other abilities allow you to build faster characters capable of dropping stun grenades and sowing confusion on the battlefield. The skill system isn’t as deep as your standard RPG’s equivalent, but it gives you a fair amount of flexibility. I appreciated the balance of action and strategy, as there’s a decent amount of tactical flexibility on the battlefield outside of the skill tree abilities. Picking up limited-use weapons discarded by dead foes briefly slows down time, making it advantageous for you to constantly cycle weapons even if it’s just so you can have two seconds to plan your next move. Fuel tanks and other hazardous environmental objects that can deal damage to enemies are littered around most environments, and several weapons can blow through objects to kill enemies if you’re crafty. 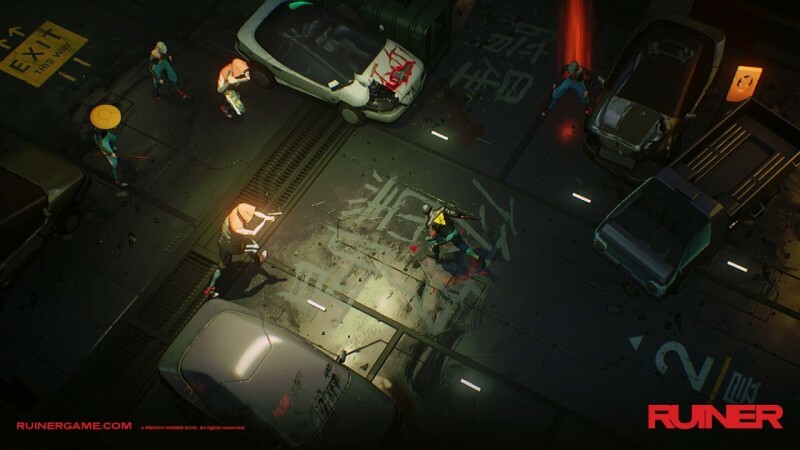 Ruiner successfully makes its action gameplay and stunning visuals its crux, but doesn’t do anything else nearly as well. The story is convoluted and, despite a few interesting tidbits related to playing with perception and who we are as people, has no payoff. None of the characters are interesting, and the dialogue is just a series of F-bombs and ho-hum observations about the awfulness of corporations. A weird hub world suggests there might be more RPG-like qualities, but you only go there three times and can’t do anything of note, so it feels like a waste of the setting. The soundtrack does its job, providing ample beats for you to bash heads into, but nothing stands out. I was also left wanting more by the end, as the four hours of gameplay didn’t quite provide enough content for me to get the most out of experimenting with the skill tree abilities. 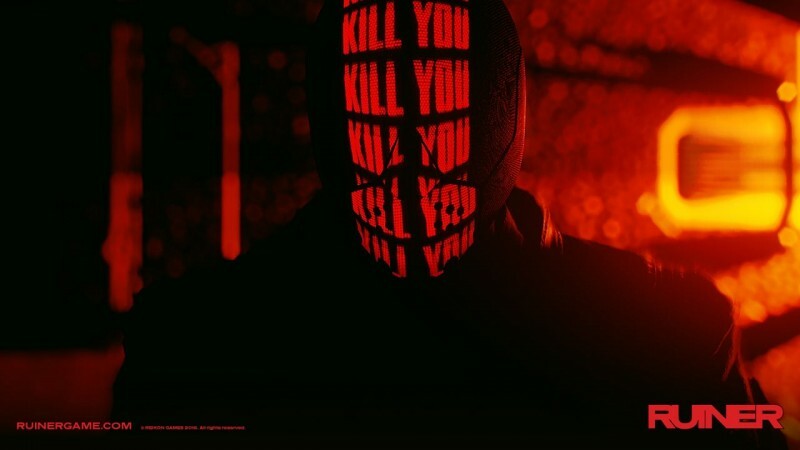 In the end, Ruiner feels like a fantastic slice of action orbited by a bunch of mediocre elements, so the experience never coalesces into something truly exceptional. However, that gameplay is solid enough to prop up this bloody sci-fi adventure, even if it never amounts to anything more than forgettable fun. 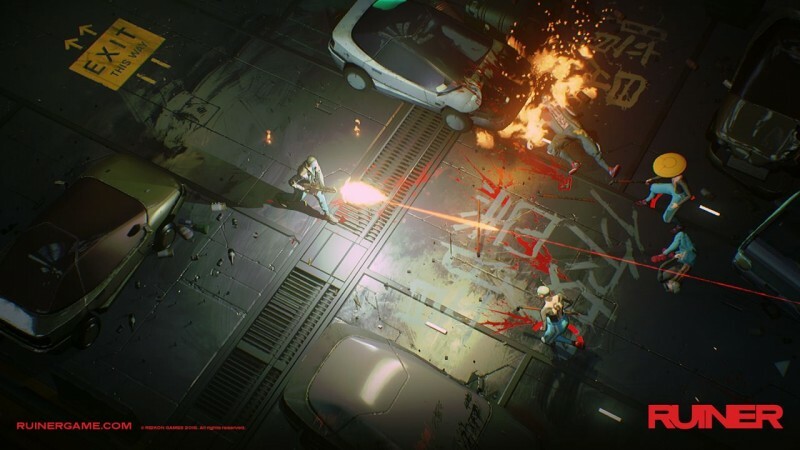 Ruiner delivers the thrills but is lacking in nearly every other department.